We replace screens of all sizes, shapes, and colors. Bring in your torn screens and we will have them rescreened, or order new screens. We also have pet screens, sun screens, solar screens and heavy duty security screen doors. Screen Doors, Security Screen Doors, Greenhouse Windows. Tru-Frame security screen doors are also available with a French Door kit for double doors. Brilliant ideas for your home. Block Windows, Block Walls and Decorative Glass Windows. Pre-framed and ready to install, acrylic block windows are available in new construction as well as custom-sized retrofit. 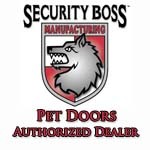 Security Boss Manufacturing, LLC is one of the leading manufacturer of high performance pet doors. The MaxSeal line is available in several models. Maintainable forever, these doors feature a limited lifetime warranty and are designed for optimum performance.